One of the most important things to remember when doing this food list is the number of different names that foods can go by. It’s how found beauty heart radishes and honeyed jujubes, now I can add golden needles to this list. 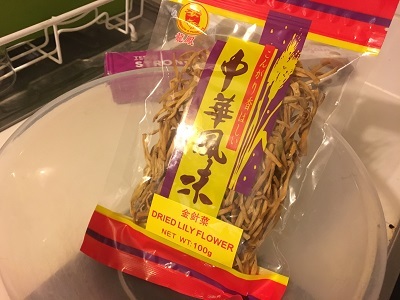 Knowing that golden needles and dried lily flowers are synonymous is probably a very basic piece of Chinese cuisine knowledge… so consider me basic at cooking Chinese food. Going into this (with the 9 hour cooking time of the green flageolets on my mind) I wanted to make sure I was able to get these properly re-hydrated and prepared before I started cooking. Honestly, I wish these were a bit less of a pain with the whole ‘chopping off the hard’ bits, but that’s small potatoes compared to some of the preparation I’ve had to do. In order to properly enjoy the golden needles it made sense that made something semi-traditional: moo shu pork. I know that the recipe requires egg, and that this picture is eggless, but my husband doesn’t like eggs… so I hid the scrambled egg underneath amongst the fried rice. 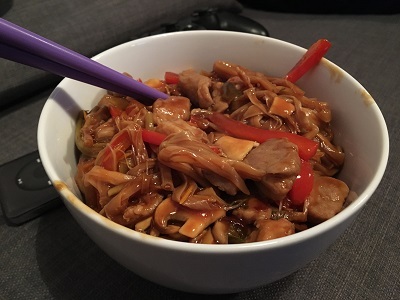 A quick comment on the recipe – this actually tasted like something I have had in Chinatown before. I would heartily recommend making the moo shu pork from the link above. It was delicious and I look forward to the leftovers I am having for dinner tomorrow. So how did these re-hyrdrated lily flowers taste? Well, if you have ever had enoki mushrooms then you’ll have an idea. They’re a bit sweet and have a fragrant and musky flavour. 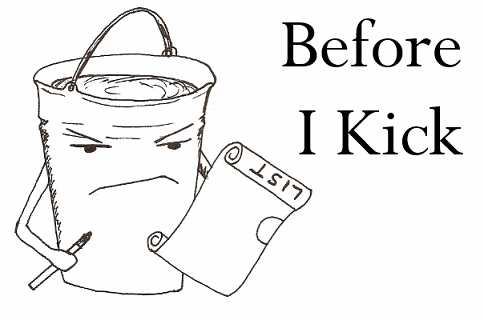 It’s almost like if you crossed jasmine tea and mushrooms… if that makes any sense at all. The texture of the golden needles is also worth noting. It’s like having some chewy noodles in your food, which makes for a nice change of pace. This leaves me with 50 to go before I hit the big landmark of 75%. Will I reach it by this time next year? Not sure, but I really hope so.